If you have lot of Text files and to reduce the file clutter if we combine them to a single large file then it makes lot of sense. Here comes the free utility TXT Collector that does this efficiently and quickly. TXT Collector grabs all the txt file from a directory and combines to a single large txt file. 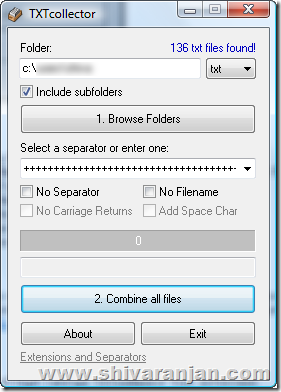 It inserts file name, directory name and separator between each txt file that is combined. It runs all Windows 95/98/ME/NT4/2000/2003/XP/Vista. I also recommend you to try the “merge” function in http://www.textslave.com, easy and quick!